I loved Julie’s earlier books, and we get sneak updates into some of those characters in this new story, but if you haven’t read them its not a problem, each book stands alone and can be enjoyed on its own. Poor Cassie, what a denouement, what a way to find out your husband and best friend have been deceiving her, but it was wonderful to read. I could just imagine the frisson of shock rippling through the attendees, all dressed in their finery, getting a treat in gossip that will enthrall them for days. 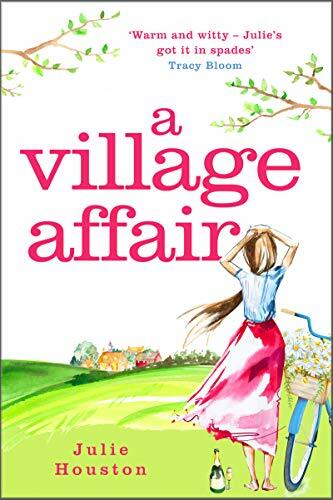 I loved the mix of Cassie’s personal life, the effect on the kids, her friends, Mark’s family ( a nice battenburg – definitely the answer to infidelity…) and their joint friends. Its difficult when couples split, often the lose friends too just when they need them and we see how hard it is for some of Cassie’s friends to deal with. She’s got a wonderful family, steadfast granddad Norman, of Norman’s Meadow, a slightly batty but very intense mum, goth daughter and studious son Tom, who has secrets of his own. Oh I so felt for him, a real Rock and Hard Place scenario. Somehow with the help of friends and family Cassie pulls through, and becomes stronger, more her own person. Dealing with the threat of a huge housing development which she and others feel would ruin the village she’s fighting hard against it. The developer though and his son, Xavier, bring out more issues for Cassie to deal with and its a deliciously complicated tangle of events and emotions. Of course I’m a romance reader, and books with some element of romance work best for me and I wasn’t disappointed here, I loved that part. Reaching the end reminded me so much of a song my kids loved when they were pre-teens (and of course really didn’t know what it was all about!) “Shame and Scandal”, it really was like reading a book version of the story, and probably something that plays out more often than we imagine. Stars: Five, a perfect escapist read, with both drama and romance, and lighter parts to lift the whole feel of the novel.